Bismuth is a silvery and brittle metal that is frequently found in low-melt alloys. Demand for bismuth metal has grown over the past 20 years in large part due to its effective use as a substitute for lead. Bismuth is a brittle, silvery-green metal that has a low melting temperature and high specific gravity. Being both stable and non-toxic, bismuth is often used as a replacement for toxic metals such as antimony, cadmium, lead, and mercury. Like water, bismuth is less dense as a solid than as a liquid (it expands as it cools), a property unique for a metal. Of all the metal elements, bismuth also has the highest electrical resistance and the lowest thermo-conductivity (except mercury), as well as the highest Hall Effect (increase in electrical resistance when placed in a magnetic field). Bismuth was first recognized during the Middle Ages, but, with no ability to isolate the metal it was often confused with tin, lead, antimony, and zinc. In 1450, German monk Basil Valentine first made reference to wismut, or 'white lead', which would later be Latinized as bisemutum. Extraction of bismuth for use in pigments began as early as the 15th century from silver mines in Schönberg, Germany. In the mid-18th century, research by Johan Heinrich Pott and Claude Geoffroy led to a better understanding of bismuth and its unique properties. Medical practitioners were, at this time, also becoming aware of bismuth's beneficial properties in treating gastric conditions. The first metallurgical uses for bismuth were in pewter alloys, where it was used with lead and tin to lower the melt temperatures, and in alloys with antimony for printing press type metals. A major stimulus to the bismuth industry came in the mid-1990s with the Safe Drinking Water Act Amendment (1995), which prohibited the presence of lead in drinking water fixtures in the US. For the past 20 years, the lead-free movement has resulted in bismuth's adoption in a wide range of applications. Bismuth most often occurs naturally in the sulfide ore bismuthinite (Bi2S3) or the oxide ore bismite (Bi2O3). However, extraction of such ores solely for its bismuth content is rarely economical and bismuth is, instead, primarily produced as a by-product of lead smelting. In China, large quantities of bismuth are also extracted from tungsten, tin and zinc ores. Extraction of bismuth metal from lead commonly occurs via one of two processes; the Betterton-Kroll Process or the Betts Process. The Betterton-Kroll Process separates bismuth from lead through the introduction of calcium or magnesium into a molten solution of the lead and bismuth. The resulting calcium or magnesium bismuthide, being lighter than molten lead rises to the surface as dross (solid impurities) and can then be removed. The dross is then treated with chlorine at temperatures of around 572-932°F (380-500°C) to remove the magnesium or calcium. High purity bismuth is produced after treatment using sodium hydroxide. 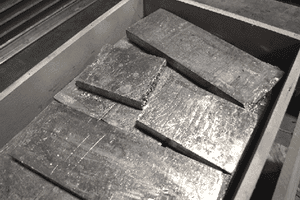 The Betts Process involves electrolytic refining of lead bullion. In a catalytic solution, pure metallic lead plates onto the anode, while impurities, including bismuth, settle to the bottom of the vessel. The muddy mix of metals can be melted to produce a metal alloy and a bismuth-rich slag, which is then reduced with carbon to produce bismuth metal. In China, mixed concentrates of bismuth are produced by leaching, magnetic separation and/or differential flotation techniques. Concentrates are then smelted to produce crude bismuth for refining. The largest bismuth producing countries are China, Peru, Mexico (crude and refined) and Belgium (refined). In 2013, the US Geological Survey estimated global world refined bismuth production to be about 17,000 metric tons. Of this, Chinese production accounted for approximately 90 percent. With more than 70 bismuth mines, China also accounts for the vast majority of global bismuth reserves. Major bismuth producers include Hunan Nonferrous Group (China), Shizhuyuan Nonferrous (China), Penoles (Mexico), Sidech (Belgium), and MCP (UK). Due to bismuth's brittleness, pure forms of the metal are not used in metallurgical applications. It is, however, used as an additive alloy in copper, aluminum, iron and steel as a substitute for lead and to toughen and make alloys that are more machineable. Elementymology & Elements Multidict. Bismuth.